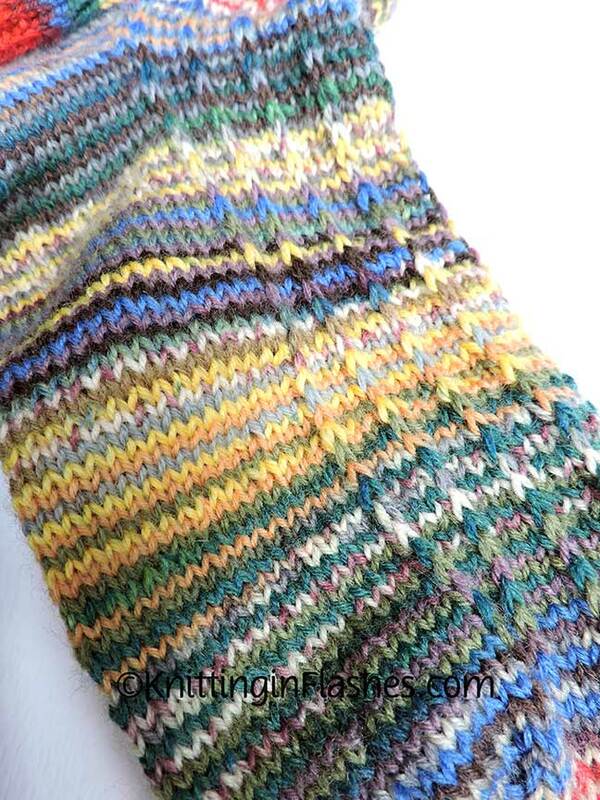 Continuing on with Dorothy’s Slipped Stitch Spiral knit sock pattern, I bring you a tri-color pair. 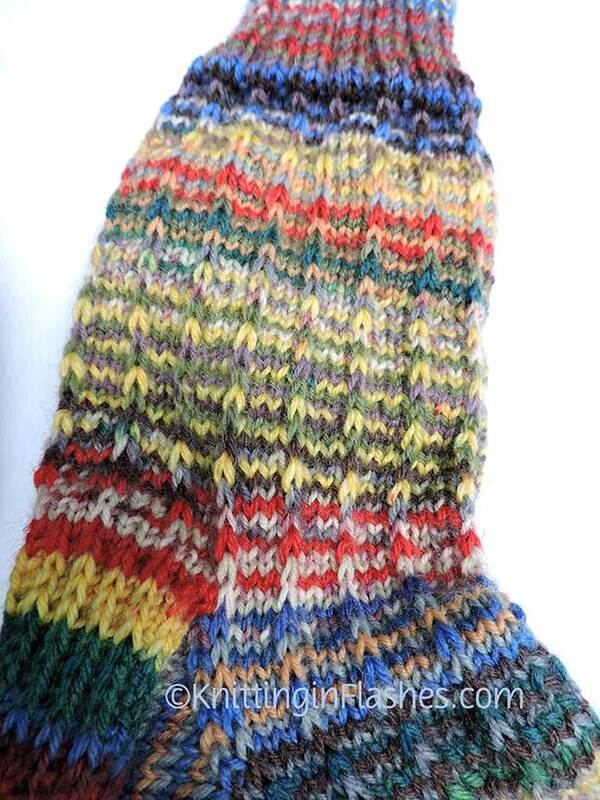 Yarns used: Soles & More in the green/blue colorway, Trekking XXL color 803 (orange/purple/brown), and Reggio exclusive self-striping yarn in primary colors #705. I managed to get three pairs of socks out of the Trekking yarn and I still have some left over. I needed ball number two of two balls of the Soles & More to complete the second sock in this pair and have plenty leftover for another pair. One ball of the Reggio was plenty for this pattern. I still have another one. I love this pattern. (Can you tell?!) It’s interesting to see how the colors play with each other and when each color or pattern changes. Plus I’m using up yarn that I bought years ago thinking I would like the colors/patterning but realizing that that wasn’t the case. 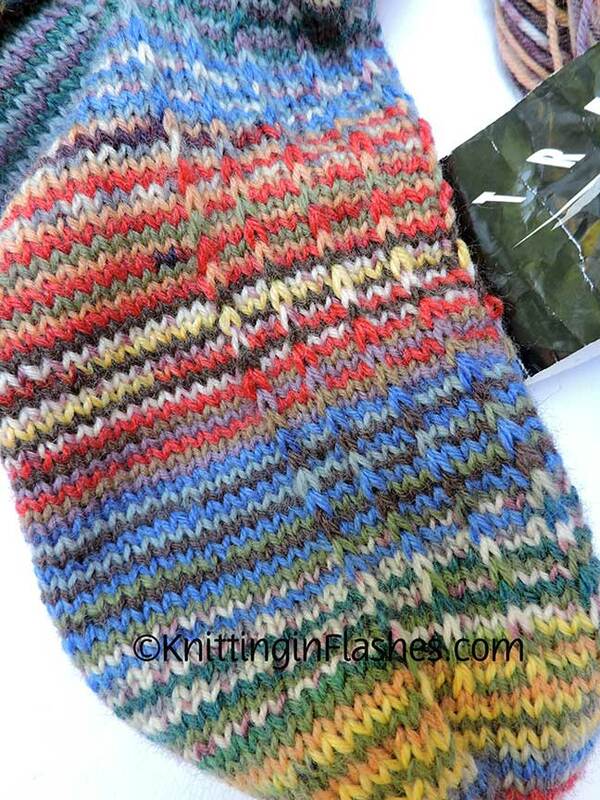 The Reggio was self-striping and the colors were not equally divided stripes so one sock has more red than the other. I suppose I could have cut the yarn when I started the heel so the red would be more dominant on the foot but since the stripes and patterns weren’t going to match up anyway, I decided not to change it. Weaving in another loose end was also a factor. I’ve got ANOTHER pair on my needles! 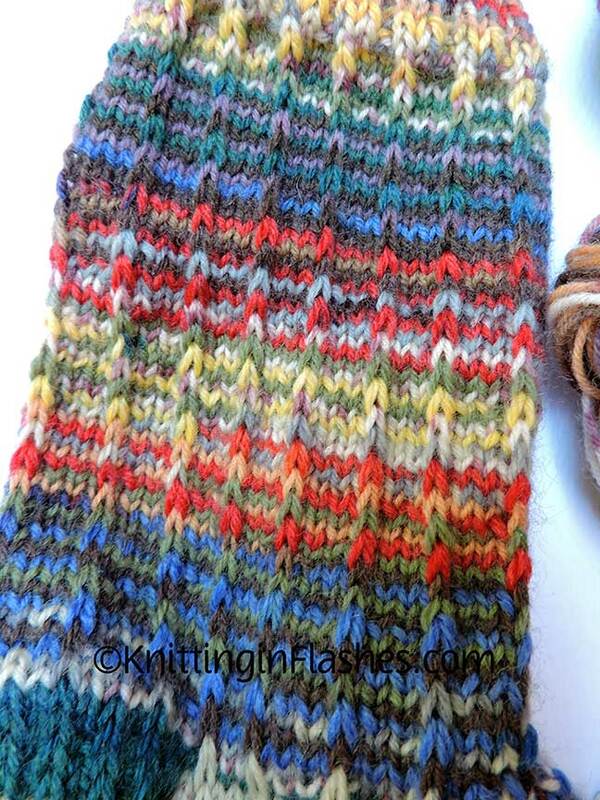 Using three colors: two self striping and one self-patterning. You’ve seen two of the colorways but I’ve added a different third one for this next pair. 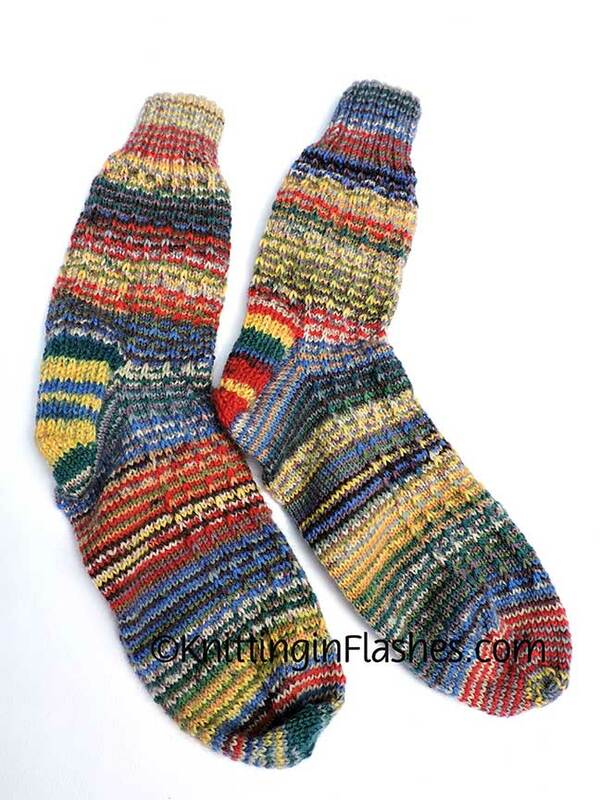 This entry was posted in finished object, knit, knitting, knitting pattern, sock, yarn and tagged finished object, knit, knitting, pattern, sock, socks, yarn by Patti_is_knittinginflashes. Bookmark the permalink. Those are so neat. 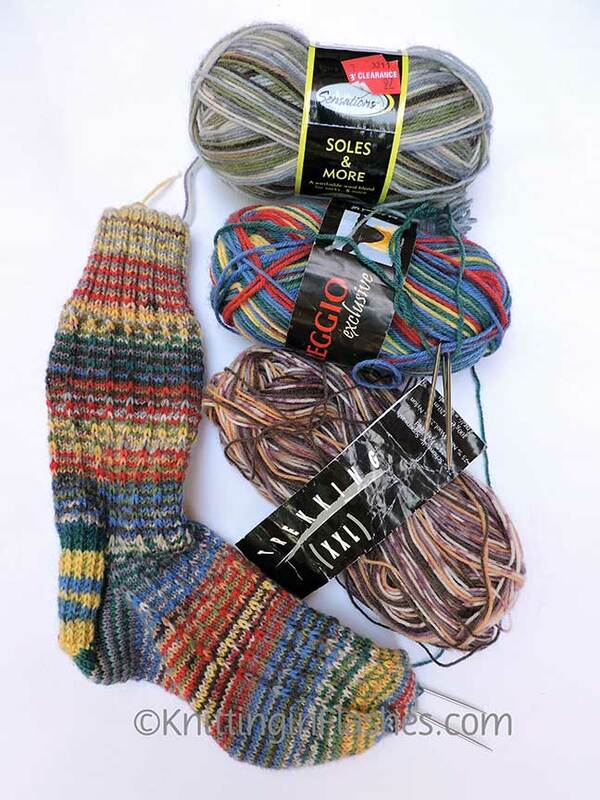 Plus you can mix and match socks!